Plum Tomatoes – Roasted Air-Fried and Delicious! Today we harvested the last of our plum tomatoes from the garden. Wanting to luxuriate in the last of our bounty, I was determined to make the most of the richness and umami flavor that can be imparted when a plum tomato meets high temperatures, as in roasting. That being said, however, that were only five beauties; so it seemed sinful to turn on the oven for such a small batch. Ah, but alas! Not to be diverted from my goal. The perfect solution was the air fryer, which has become my go-to appliance on the kitchen counter. 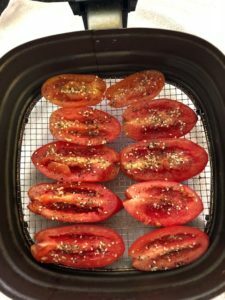 The prep was simple – I cut the plum tomatoes in half lengthwise, laid them cut side up in the air fryer frying basket, sprinkled a dash of Himalayan pink sea salt, sesame seeds, garlic powder, and fresh ground white pepper on top, put them in the air fryer at 390 degrees Fahrenheit for 15 minutes, and let the air fryer do its duty. Out came the most magnificent, and I do mean magnificent, lushly roasted plum tomatoes. Much of their moisture evaporated, leaving these tender yet sweetly caramelized halves that barely stayed around long enough to let them cool completely. We devoured them in no time flat after removing them from their staging plate for this photo! (Bonus that Richard and I both got to share them as our mid-afternoon snack today. Afterwards, it got me to thinking….next time I will grill romaine lettuce halves with a scant amount of olive oil, fresh garlic, and sea salt. 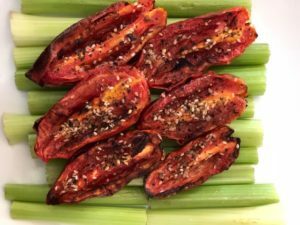 Serve them grilled side up with a drizzle of vegan Caesar dressing, topped with these roasted, air-fried plum tomatoes. The crowning glory to this would be to add a dollop of Miyoko’s Kitchen Artisan Cultured Vegan Cheese (I am not getting any remuneration for this shout-out. I just truly adore all her products) or similar vegan cheese atop the roasted tomato. A couple of sliced Kalamata olives and a sprinkle a bit a chiffonade basil all around, and you’ll be so exceptionally good-to-go with this dish. You will have yourself one mighty impressive, colorful, and exquisite (not to mention quick and easy) dish that can be served as your salad course, or even main disk, for any dinner party with savoir-fare. Or, as a delectable meal any day or night. Be sure to check out my full recipes section for great ideas and follow me on Facebook! 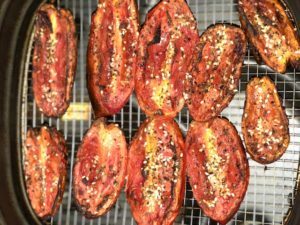 2 Responses to Plum Tomatoes – Roasted Air-Fried and Delicious! I have a air fryer. How do I dry the plum tomatoes? Is the a recipe for them? I’ve successfully used the directions in the blog — 390 degrees Fahrenheit for 15 minutes. « Thanksgiving Wishes for a Very Happy, Healthy, and Harmless Holiday!